The self-portrait of Emma Sulkowicz is actually three portraits in one. The first solo show by this young New York-based artist features Sulkowicz herself on a platform at the exhibition for specific periods of time during regular gallery hours. Also on display: a life-size sculpture of the artist, and a miniature 3D-printed replica. What does this three-pronged approach to self-portraiture mean? First and foremost, it represents a new form of interaction with the artist, who made news in 2014 for “Carry That Weight: Mattress Performance,” which found the artist carrying a mattress around her Columbia University campus to protest how the school responded to allegations of her sexual assault. “Self-Portrait” is similarly intimate and powerful. 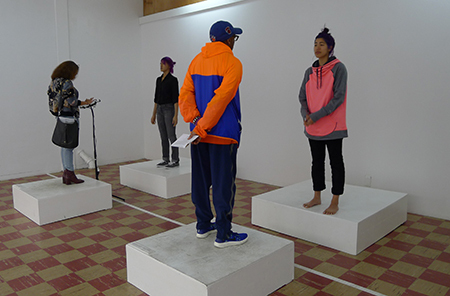 Viewers mount a pedestal, asking questions and connecting with the artist, or interacting with the Emmatron, Sulkowicz’s life-sized, unnervingly, eerily realistic statue of herself. Who to interact with? It depends on both the time of visit and whether the artist will respond to specific questions. If questions are on the flesh and blood artist’s “don’t ask” list, Emmatron is programmed to respond through an app. The third element of “Self-Portrait” is a miniature 3D-printed replica of the artist, created to represent past experience with the media, which the artist describes as flattening her image. This diminutive but life-like printed statue was produced in a 20-edition set. “Self-Portrait” is a response to the effects, for good or ill, of the media attention brought to Sulkowicz due to her “Mattress Performance.” Body as object? Artist as interpreter? A study of the ways in which society conducts inquiry, dialog, definition, or lack thereof? Viewers must objectify themselves to judge, by stepping onto pedestals of their own.